As we mentioned last week, we have been doing a bunch of work creating clothing and equipment for players to customize their character with. One of the new items created this week is a mask that we call "Sjuv". With the model of the mask now made, we figured we could ask our community to come up with some ideas of how the mask should look. So, if you have any ideas for patterns, colours or the overall design, please submit your concept - we want to see it! Feel free to either use the image below for reference or create your own template. You are welcome to email us or post your designs on our forum. Then, this time next week we will take all submitted concepts and post them on our Facebook page and let you vote for your favorite. The winner will get their design featured in the game! Please note: as you can see in the above image, the mask on the left has no eye and mouth holes cut out. This is intended so that you can design the mask how you want - you can put whatever type of holes wherever you want them. We're looking forward to seeing what you come up with! Good luck! 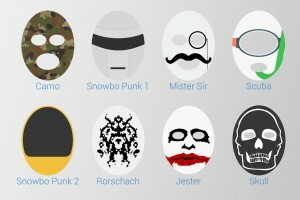 Here are the masks (these are concepts) to vote for! Head over to our Facebook page and tell us which mask is your favourite!